LookTel Breadcrumbs GPS is a location and orientation app designed specifically for the navigation needs of people with visual impairments or blindness. Using the iPhone as a pointing device, Breadcrumbs helps blind or visually impaired travelers locate orientation points, or "breadcrumbs", on a route. A breadcrumb can be dropped in your current location by simply pressing the "Drop Breadcrumb" button in the app. Then, when pointing your phone in the direction of that breadcrumb, the device will vibrate to let you know where the breadcrumb is. The app enables you to create routes by dropping several breadcrumbs along a path, such as the walk to a local post office, making it easier to re-trace your steps later. You can also drop a single breadcrumb to find specific locations or landmarks, such as the entrance or exit at the local beach or park. Breadcrumbs GPS also allows you to easily retrace your path in new or unexplored areas such as long driveways or hiking trails. By keeping you informed of the direction and distance to designated breadcrumbs, you’ll be able to independently navigate to your destination using your normal mobility methods. 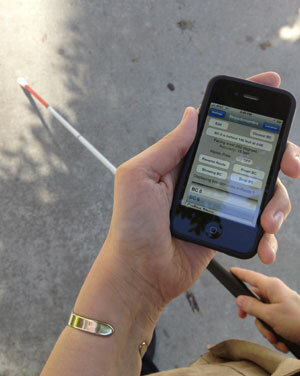 Breadcrumbs GPS is designed for both users with no vision as well as users who have residual vision. Because Breadcrumbs is designed as an orientation and location aid and not a way-finding aid, good orientation and mobility skills are recommended. The app requires iOS 5.0 or greater. The Breadcrumbs GPS App is an app for GPS-equipped iOS devices running iOS 5.0 or greater. These include the iPhone 3GS, iPhone 4 and iPhone 4S. If you have any questions or want to contact support, click here to see our FAQ or email us at info@looktel.com.